Superhubs is a behind-the-scenes look at how the world's most powerful titans, the "superhubs" pull the levers of our global financial system. Combining insider's knowledge with principles of network science, Sandra Navidi offers a startling new perspective on how superhubs build their powerful networks and how their decisions impact all our lives. 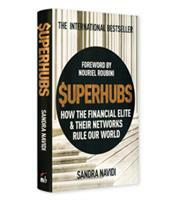 “Superhubs” is the rather inelegant but appropriate name that macroeconomic consultant Sandra Navidi gives the few, extremely wealthy, extremely connected financial elites of the world who “pull the levers of the financial system.” In her book, Superhubs: How the Financial Elite and their Networks Rule Our World, Navidi gives a balanced and surprisingly human look at the somewhat mysterious and feared financial network that controls, more than any other force, the present and future of the world. What lies ahead, according to Navidi, is troubling. Navidi uses network science, which builds on mathematics to explain the behavior of networks, to reveal the strengths and weaknesses of the powerful financial network that spans the globe. As Navidi explains, network science presents networks as “nodes” connected to each other by pathways called “links.” According to the “law of preferential attachment,” she writes, “all nodes prefer to attach to other nodes with the most connections, because a greater number of connections increases the chances of individual survival. The best-connected nodes at the center of networks are called ‘superhubs,’” the term she wisely borrows to describe the best-connected individuals in the world of finance. As in theoretical network science, the world’s financial network continues to become more and more interconnected and homogenous. Before starting her own macroeconomic consulting firm, the accomplished German-born Navidi was an investment banker, is licensed to practice law in both Germany and America, and most recently worked for renowned economist Nouriel Roubini. In Superhubs, she describes the financial elite with a narrative flair and sense of humor while not neglecting the seriousness of the threat that the lopsided system represents. Her chapter on the revolving door between politics and finance, which begins with a section called “psychological kidnapping,” is but one disturbing chapter in this fascinating and revealing best-seller.